Last week was big for Kansas City jazz. A resolution directed directed the City Manager to find funding sources for $18 million in improvements – curiously up from the $7 million announced just a week and a half earlier – to the 18th and Vine District. This could include improvements to the Jazz Museum, the Mutual Musicians Foundation, the Paseo YMCA, a new district home for Friends of Alvin Ailey, a parking garage, and some suspiciously not-yet-publicly-defined demolition along Vine (an incredibly historic street as long as you don’t destroy the remaining history there). But more on that another time, because this week is bigger. This Tuesday, January 12th, would have been Jay “Hootie” McShann’s hundredth birthday. 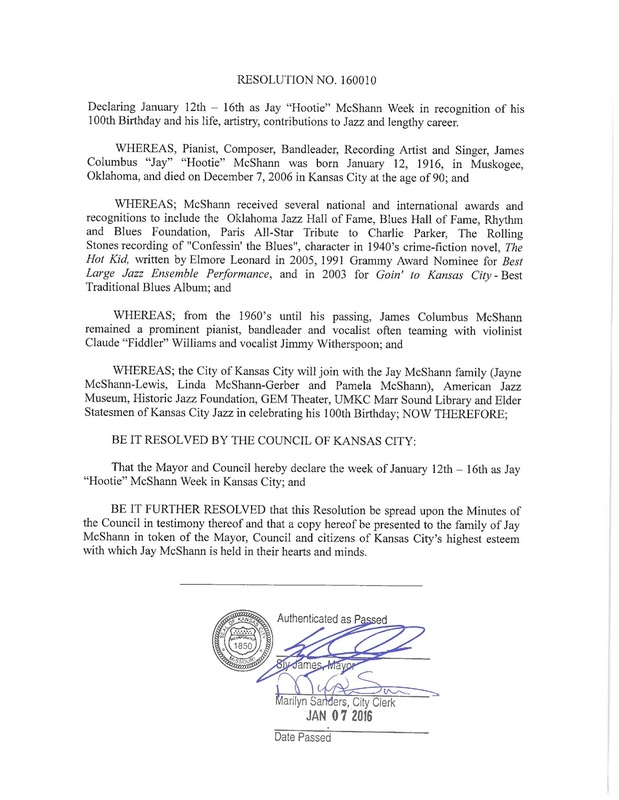 Declaring January 12th – 16th as Jay “Hootie” McShann Week in recognition of his 100th Birthday and his life, artistry, contributions to Jazz and lengthy career. 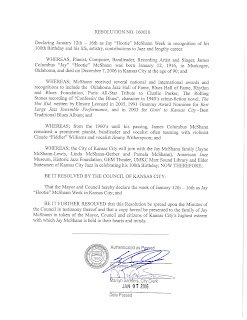 BE IT FURTHER RESOLVED that this Resolution be spread upon the Minutes of the Council in testimony thereof and that a copy hereof be presented to the family of Jay McShann in token of the Mayor, Council and citizens of Kansas City’s highest esteem with which Jay McShann is held in their hearts and minds. I’m not going to presume to lecture anyone who holds even a passing interest in this blog on the importance of a legend like Jay McShann. Until his death nine years ago, Jay McShann defined Kansas City jazz. Out in the world today, names like Count Basie and Charlie Parker may be more widely recognized. But nobody meant more to Kansas City jazz than Jay McShann. This coming Saturday, his daughter invite the city to celebrate Hootie’s hundredth birthday at the Gem Theater. The evening opens with a presentation by Chuck Haddix on McShann’s history and importance to jazz. Then Joe Cartwright sets the tone for the night leading an ensemble with Gerald Spaits and Todd Strait – McShann’s regular accompanists in his later years – and a trio of vocalists performing Jay’s standards. The wonderful pianist Benny Green takes the stage in a special performance. And Bobby Watson assembles a collection of Kansas City All-Stars to salute Hootie. A new collection of McShann memorabilia will be on display in the Gem. A reception starts about 6:00 p.m. on Saturday, January 16th. The music starts at 7 p.m. Tickets are $25.